Discover all that downtown Poulsbo has to offer at the convenient, comfortable, and the newly renovated GuestHouse Inn and Suites of Poulsbo-Kitsap, WA. 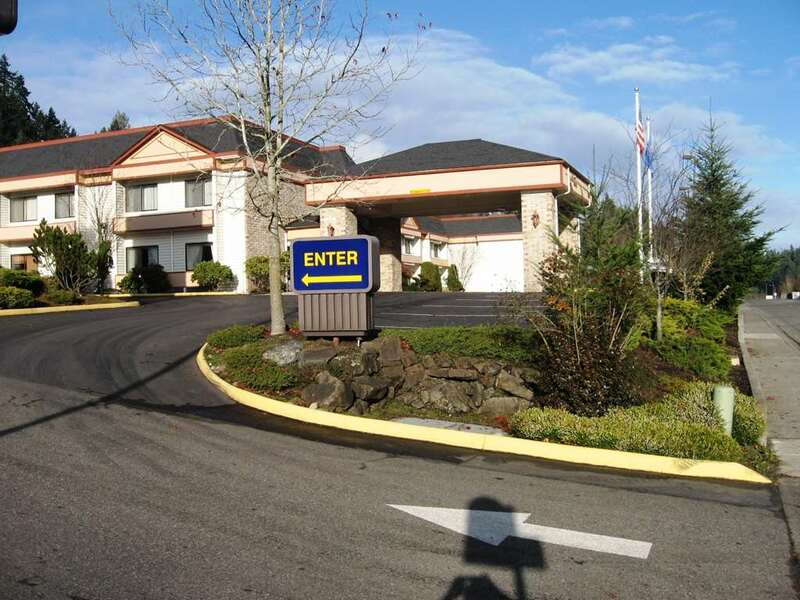 Hotel is ideal location for all government travelers as we are within minutes from Naval Base Kitsap, Naval Base Bangor, Naval Base Keyport, and the Puget Sound Naval Shipyard. Also, we are the closest hotel to Gravitec Training Center. Hotel is conveniently located in a shopping mall as you are at the heart of everything from shopping, dining, entertainment, and the arts. Our hotel sits less than one mile from the Poulsbo Marina, where you will find many intriguing shops and delicious Northwest cuisine within walking distance. Complimentary local gym passes are provided for all guests. Whether you are coming to Poulsbo for business or pleasure, our stylishly decorated rooms will be your personal retreat. Try your luck at the closely located Clearwater Casino and the Point Casino. Complimentary shuttle is provided by the Clearwater Casino. Poulsbo is also well known for its many antique shops and Scandinavian bakeries. We are accessible from a short, but breathtaking 30 minute ferry ride across the Puget Sound via the Seattle and Bainbridge Island Ferry and the Edmonds and Kingston Ferry. Whether traveling on business or just seeking a quiet retreat from the fast pace of city life, GuestHouse Inn and Suites Poulsbo features amenities and unequaled service that will ensure your stay with us will be an unforgettable experience. Our Hotel is a 100 smoke-free facility. Gig HarborHWY 16 West. Turns into HWY 3 North. Take the Bainbridge Islannd/Poulsbo Exit. Take a right off the ramp onto HWY 305 South Bound. Right on Liberty Road. EdmondsGet on the WS Ferry from Edmonds Pier to Kingston Ferry (25 minutes crossing). Stay on Hwy 104 west bound. Left on HWY 305 South Bound. Right on Liberty Road. SeattleGet on the WS Ferry on Pier 52 to Bainbridge Island (ferry crossing approximately 30minutes). Once off the ferry stay on the HWY 305 North for 15 minutes. Left on Liberty Road. BremertonNorth on HWY 3. Take the Bainbridge Island/Poulsbo Exit. Right off the ramp onto HWY 305 South. Right on Liberty Road. TacomaTake Hwy 16 west toward Bremerton. Hwy 16 turns into Hwy 3 north. Take the Poulsbo/Bainbridge Island Exit on Hwy 305. Turn right off ramp on to HWY 305 and take a right on Liberty Road. Port TownsendCross the Hood Canal Bridge going South. Right on HWY 3 South Bound. Take the Poulsbo Exit. Left onto HWY 305 South Bound. Right on Liberty Road. PoulsboLocated in the heart of Poulsbo just minutes away from the Poulsbo Marina. 1 block off of HWY 305 on Liberty Raod. SequimCross the Hood Canal Bridge going South. Right on HWY 3 South Bound. Take the Poulsbo Exit. Left on HWY 305 South Bound. Right on Liberty Road. SilverdaleNorth on Viking Road. Right on HWY 305. Right on Liberty Road. Bainbridge IslandNorth on HWY 305. Left on Liberty Road. Port OrchardHwy 3 North. Take the Bainbridge Island/Poulsbo Exit. Take a right off the ramp onto HWY 305 South Bound. Right on Liberty Road. KeyportNorth on Viking Way. Right on HWY 305 South Bound. Right on Liberty Road. Port AngelesCross the Hood Canal Bridge going South. Take a right onto HWY 3 South Bound. Take the Poulsbo Exit. Left onto HWY 305 South Bound. Right on Liberty Road. SuquamishNorth on HWY 305. Left on Liberty Road. Port GambleSouth on HWY 3. Take the Poulsbo Exit. Left off the ramp on HWY 305 South Bound. Right on Liberty Road. Port LudlowCross the Hood Canal Bridge South Bound. Right onto HWY 3 South. Take the Poulsbo Exit onto HWY 305 South Bound. Right on Liberty Road. IndianolaHWY 104 West. Left on HWY 305 South Bound. Right on Liberty Road. Naval Base KitsapHwy 3 north. Take the Poulsbo/Bainbridge Island Exit on Hwy 305. Right on Hwy 305 south. Right on Liberty Rd. Bangor Sub Naval BaseHwy 3 North. Take the Poulsbo/Bainbridge Island Exit onto Hwy 305 S. Take a right on Liberty Rd. Naval Base KeyportN. of Viking way. Right on Hwy 305 S. Right on Liberty Rd. Puget Sound Naval ShipyardHwy 3 N. Take the Poulsbo/Bainbridge Island Exit onto Hwy 305 S. Right on Liberty Rd. KingstonHwy 104 west bound. Left on HWY 305 South bound. Right on Liberty Road.